For having no intention to produce a production vehicle, Buick sure does love teasing us with the Avista concept. This time, it has brought its award winning coupe to the 2016 New York International Auto Show, but in red. The hue is Lacquer Jewel Red, to be specific, as coined by the brand. 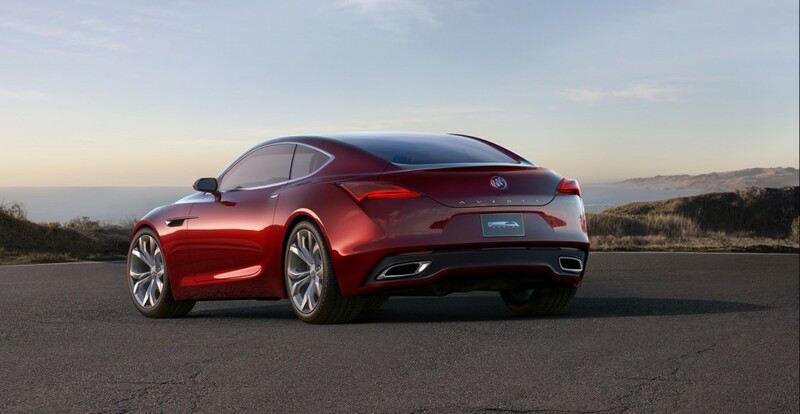 In addition to the deep red color, Buick has switched out the taillamps for a pair of strictly red units, ditching the chrome-red ones from the original show car. The new taillights look very jewel-like, playing well with the name of the exterior paint hue. Apart from the exterior, the interior has been completely redone, too. The latest show car foregoes the bright white and gray color hues, and instead trades them for darker sand colors, gray and black. The color combination plays extraordinarily well with the deep red color, making for a very pleasing contrast in person. However, as we’ve stated before, the attention the concept is garnering is the end of the road. There will be no production Avista, as much as we’d like it to be so. Instead, we’ll have to think of what could be for a proper halo vehicle by Buick. This keeps reading like a double-fake to me. Concept cars that are nixed, don’t get redone in new colors and new trims. Buick’s chiefs are all saying “no plans for now.” Heck, we heard that about the Solstice in 2002. We heard that about Z/28 5th Gen a whopping six months before it happened. When you look at the ATS Coupe, and its sluggish sales, it would be fairly easy to put a new front clip, rear bumper and trunk on that. Swap the seats, knock $5k off it, and you have a profit margin that is healthy and keeps plants from going idle. I’m not convinced it won’t happen. Avista will be new Regal sedan, remember my words! As much as I would like it to be…No it won’t…the new Regal will be an E2XX FWD car. A car based on Avista would be a step up from Regal and LaCrosse. It would likely cost $50k. I want this car to happen. There is absolutely room in GM’s portfolio for this, Camaro does not fit the bill for everyone and I don’t really like the ATS-V coupe – it’s far overpriced for what it is. They took a 50k car and added 12k to it for no apparent reason. The Avista has a beautiful wide stance and lots of glass area to see out of. These two simple features are hard to find in any new two door vehicle. Looks like a great sports/luxury car. I would enjoy riding in this car. I wonder if they built two examples or just repainted it and swapped out interiors? If they build two, I’m betting you they have plans for production. They’re just keeping it quiet because they’re introducing 4 new models this year and don’t want attention pulled away from them. Just imagine if they said we’re building it. Everybody would forget about Envision, LaCrosse and anything else they’re bringing to showrooms this year. The Avista was built in two cars one blue and one red for the show season as some shows happen at the same time. GM has little as do most automakers this year in show cars. Buick wanted it to be a focal point of their display. Now that does not mean it will go production so do not read too much into this. From what I am hearing and seeing it appears some are trying to make a business case for the car but it will be a tough one with the stagnate market for the coupe right now other than the Camaro and Mustang. Also GM has a lot more profitable ventures going right now that would prove to sell more volume and make more money. To be honest a car like this would sell in smaller volumes but could really draw more people to the show rooms and sell more Lacrosse and Envisions. This has happened often like in the 80’s with the TA and Fiero. They drew a lot of attention to Pontiac and sold a lot of Grand Am’s delaying the killing of Pontiac as the target moved from them to olds. Here is the problem. Making a case for profits and volume at a t price they can sell it for. Then how much would it take to convert and engineer it to be a real car. Finally how much will the car change and will people still be interested and will the car still be practical. Building a car today and bringing it to market is difficult. Making a business case is even more difficult. So while the there is a chance it is not going to be an easy road. If it comes to market and does not meet volumes it could set back other cool projects later. This is a car that could so some good at Buick but Buick will do well even if they do not have it. They are not in the Hail Mary mode. If they make a mistake here it could cost them time and money for a more profitable project. I still think we may see a compromise of a coupe styled sedan on this and they could satisfy a wider set of customers. One last thing even if they started today it would be 4-5 years before it comes to market. One thing that hurts this car now is the Alpha is not for RHD. This kills a version for England and Australia. Holden and Vauxhall would be important in a program like this. Scott3, I think your last sentence is the key. Without Alpha being set up for RHD does seem to be a negative for the Avista seeing daylight. I am a lover of the Coupe and would like to see this made just to get some variety out there. We know the sales would be low and not too sure about the profit margin on this car. A huge plus is that this car would give a great boost to Buick’s image…commercials can only do so much. Dear Buick, please stop teasing me. Nobody likes a bully! I have to agree with Christopher on this one . I believe its out of the ordinary for an automaker to completely change a concept this way . And even changing out the rear taillights . GM just came off a very profitable year and their forecast for this MY is a good one as well . Even though it may be a niche car there are other automakers producing luxury coupes and are doing well doing so . Even if the Avista wasn’t a huge money maker it would be a huge image maker . I also agree with Greg too . With the Envision coming to market along withe the LaCrosse and a refresh of the Encore , Buicks year is full for introductions . I can see a 2018 timetable for it . As long as its priced right and offers the right powertraine , and continues to create the buzz that automakers look too there would be a business case for it . SUV’s are not going to always be what the consumer wants . Not really as we have seen it before and often. Remember the original Bonneville show cars from Motorama. There was a red one and green one. Same through the years with other cars too. We have seen the same in the Corvette Indy Cerv and other. Even Pontiac had made more than one show car and never said anything about it till we found out later there was two. I found the car they used at shows and th cover of hot rod with the black and yellow paint was a twin. One had a DOHC 4 and the other a stock v6. they did two turbo 2.9 fiero’s one red one black. This thing was molded from fiberglass so it was not an expensive car to make. I could dig around and show many examples of more than one show car. Also I can show many examples of reconfigured show cars that had two lives. Not saying 0 chance at production but don’t read too much into two show cars. What’s the use of showing the Avista in different colors when the decision has already been made by the powers that be on not to bring the Avista to production. Buick is making a serious mistake not building this car in either two door or four door form. It is a game changer for folks who would not consider a Buick. It will get them in the showroom to view the Avista and consider other cars in the lineup. I will say that I love the color and the tweaks made to the exterior and interior, but I’m depressed that this car isn’t going into production. This is a game changer for GM and Buick and I can’t understand why the C-suite doesn’t get it. Build this and we will come…..2018 Buick Avista – Absolutely a gorgeous car. A shame we don’t see the likes of these built anymore. Think back the 2 doors from yesteryear when we had the 2 doors we once drooled over and said “man..one day im going to get that car!”. Very rarely do we say that about a car we see today. Cars like that of old like the Grand Am, Grand Prix, Trans Am, Fire bird, (yes i thought Pontiac did have and build this excitement….damn shame they killed off the cars line that had the best lines “at that time period”) and cool 2 door cars from Oldsmobile like Reatta, Riviera, and Toronado. Yes quality did lack and these cars did have some issues..but the lines with the 2 doors…and remember all the trim packages these cars came in? How about exhaust notes? Have about little things like “inter cooler” and ram air. Today, we have gotten away from 2 doors and all the pleasantries and have gone for the blah 4 doors. Its time GM to bring back the 2 doors we cherish. Build the Avista GM..Build it….and we all will line up in droves to get this car. You have my vote! Man is the Avista beautiful! 1000 times better looking than the ATS coupe.